Tom Wildblood with the shaken badger. 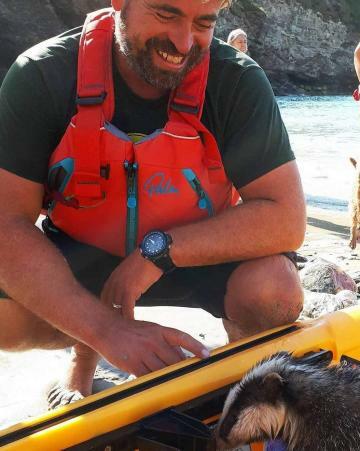 A baby badger fell some 30m off a cliff in Cornwall, into the sea, scrambling up to a ledge but getting trapped there. 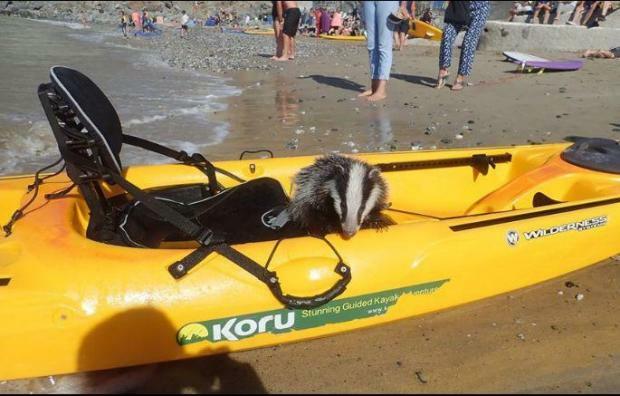 The terrified animal was spotted by Tom Wildblood, a kayaker belonging to a local club, the Koru Kayakers. Although the animal did not take kindly to being rescued at first, it eventually realised that it did not have much choice and allowed itself to be taken to shore on his craft. The badger was then taken to be checked by a vet in St Clement's. The stricken creature survived the death-defying plunge and had scrambled to relative safety on a cliff ledge off the north Cornwall coast.